The antidote to the hectic pace of festivals and town is to get back out on the water and seek quiet places. 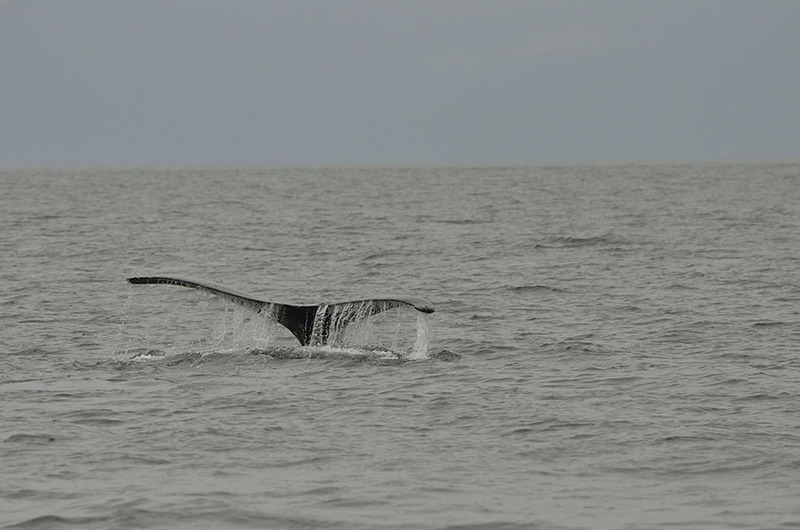 We had plenty of whales to keep us company on the way to Cannery Cove at the bottom of Admiralty Island. 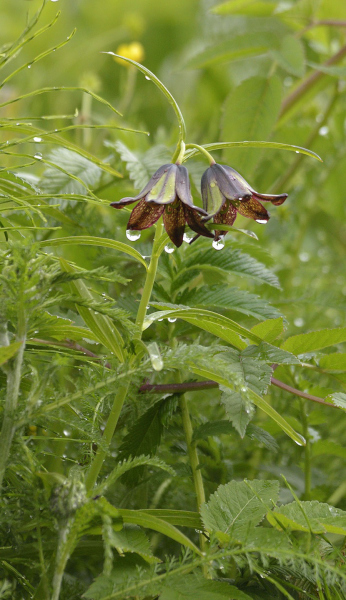 The weather wasn’t the nicest – it was the typical overcast with some occasional rain, but that didn’t dampen the beauty of the huge rock bowl and the numerous silvery strands of waterfalls. The weather wasn’t very good for kayaking or dinghy exploring, but it was just good to e-x-h-a-l-e.
We headed across Stevens Passage to a investigate a new spot – Sanborn Canal. 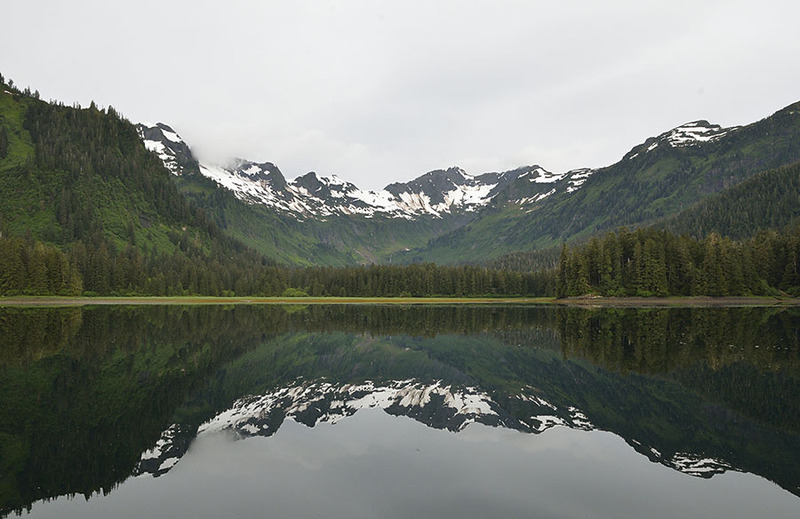 It’s a small inlet off to the side of a much larger glacier carved inlet, with a big meadow at the head, bisected by a creek. It should have been a great place to see bears, but we never saw a single 4-legged mammal in the several days we spent there. 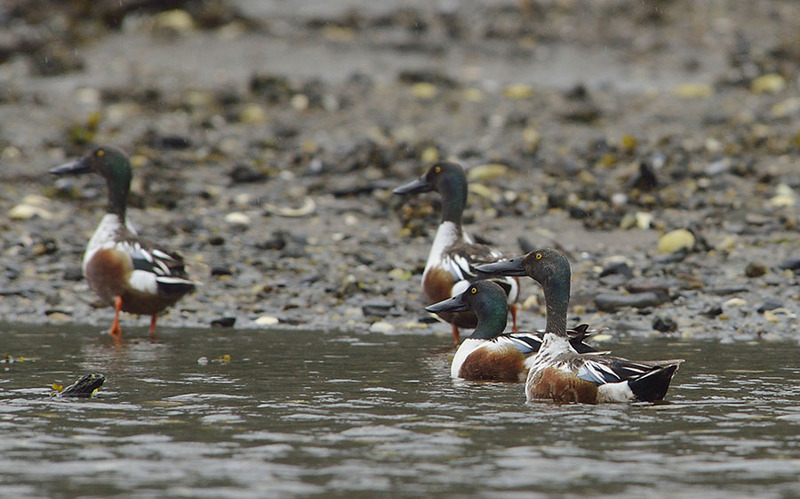 The bird life was good though, with all three types of loons, mergansers, eagles, and northern shoveler ducks (a first for me). 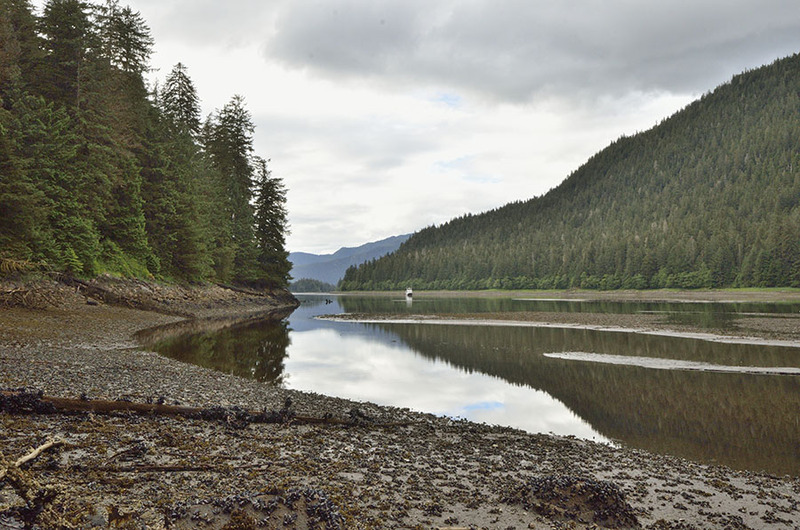 The head of the inlet shoaled to dry land at low tide, so I waited until the last hours of the rising tide to kayak up the creek, armed with bear spray and plenty of camera gear in dry bags. The creek meandered through the meadow, and as it turned I could see bigger mountains and a huge cascade in the distance. Some kingfishers were chittering and dashing around, and I was lucky enough to get close enough while they sat still a few times. 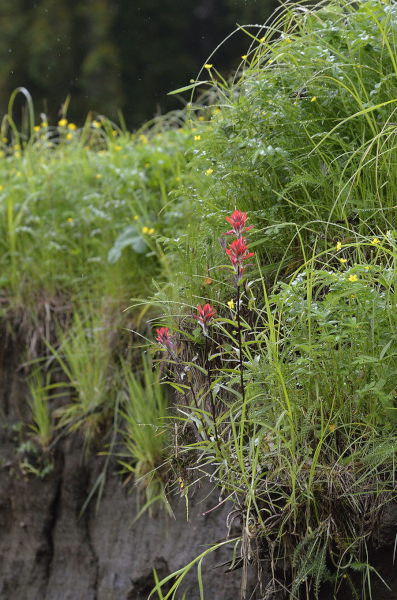 Besides the grand view, the upper meadow was awash in colorful wildflowers… so pretty. There was plenty of water up the creek, but I was worried about the falling tide leaving me stuck behind the dry bars at the saltwater end, so I stopped my exploration with more creek left to investigate another time. 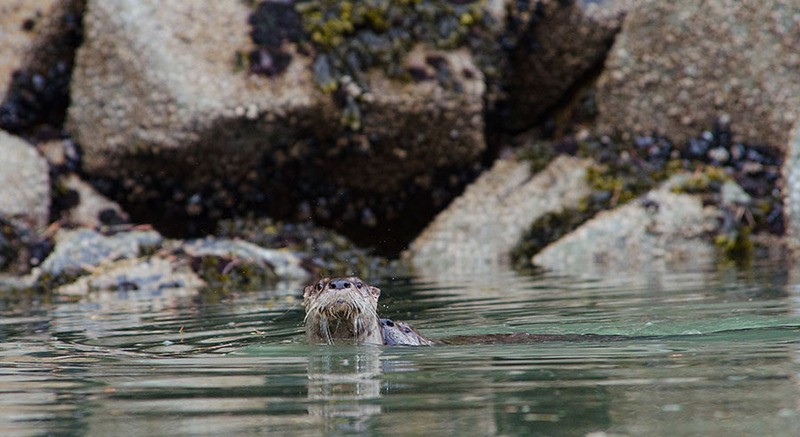 On the way out I had a few little spies keeping an eye on me – young harbor seals. By now you may be asking, “where’s the ‘Icy Excitement’ you promised?” Up until now we were enjoying peaceful and relaxing days. Our next destination was Holkham Bay where two long glacier-cut arms branch out in opposite directions, each with glaciers at their heads. We heard reports that Tracy Arm was completely blocked by large icebergs, but that Endicott Arm was open all the way to the Dawes Glacier. 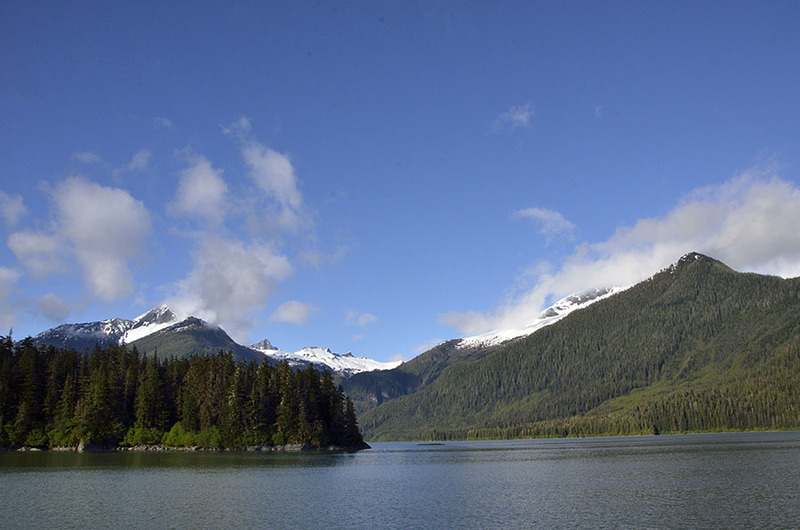 We headed to the best of the very very few anchorage options in the area to stage up for the next day’s trip up to the Dawes and back. 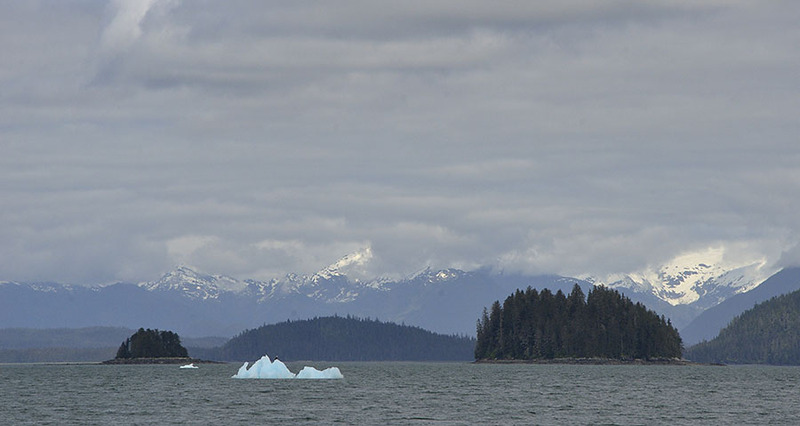 This berg was near the entrance to the Bay, and to give you an idea of its size note the little black speck on the far right end – that’s a bald eagle. 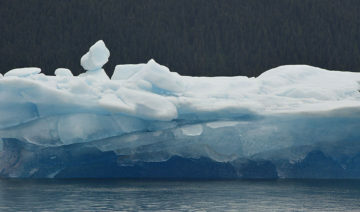 The reports were quite true – there were a lot of big icebergs choking all of Tracy Arm, though the eagles seemed happy about it since we saw a number of them perched atop the bigger ones. 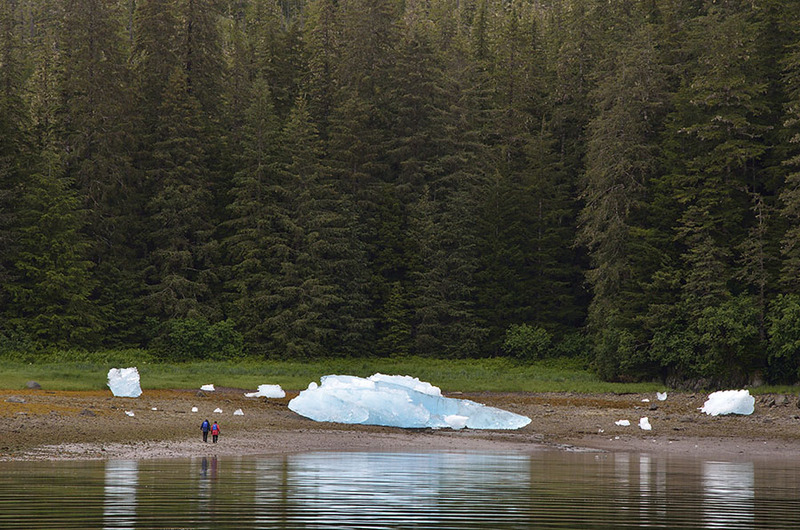 The most protected anchorage gets fairly shallow – to about 50′ so that helps to keep the big bergs out – they will run aground before they can get into the cove. Unfortunately we were experiencing extra large tides because of the full moon, and that combined with strong winds from the south made things a bit more interesting. We were anchored with a few other boats, and we kept an eye on a few big bergs that were trying to get into the anchorage. High tide was at midnight, so if the bergs stayed away until then we could rest easy. As the water rose and the wind-blown waves got bigger, some of the bergs occasionally skipped along the bottom… sneaking up on us. The sailboat next to us decided to pick up their anchor and move – which was good since a big berg broke free and slowly drifted right over their old position. We were watching a bigger berg that was in front of us, and we finally decided to fire up the engines and stand ready in case we needed to move around 11pm. It was blowing 25 knots or better and raining – but that’s typical for Interesting Boating Events – icebergs never chase you on nice days. 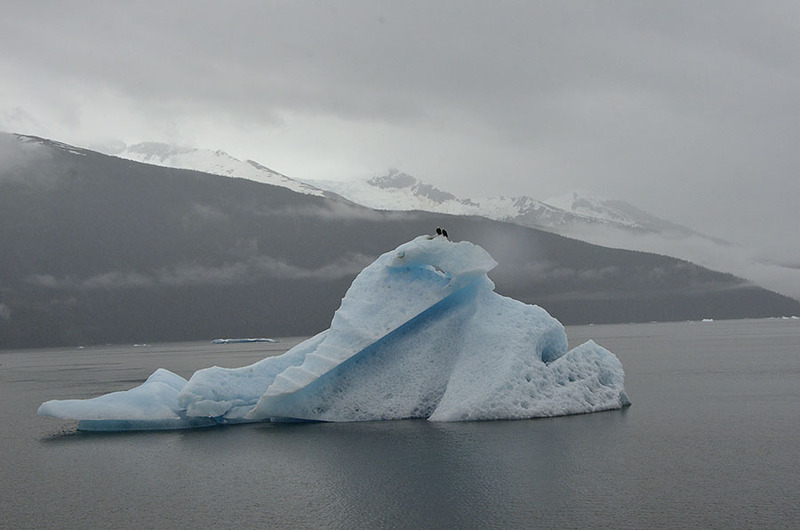 “Our” berg finally started moving more deliberately, and we swung the boat off to the side to avoid it as it slowly drifted by. We stood by until the tide started to fall and the berg was safely grounded on shore behind us. It’s hard to tell how big this beastie is from the photo, but it was about the size of ADVENTURES when it drifted by. 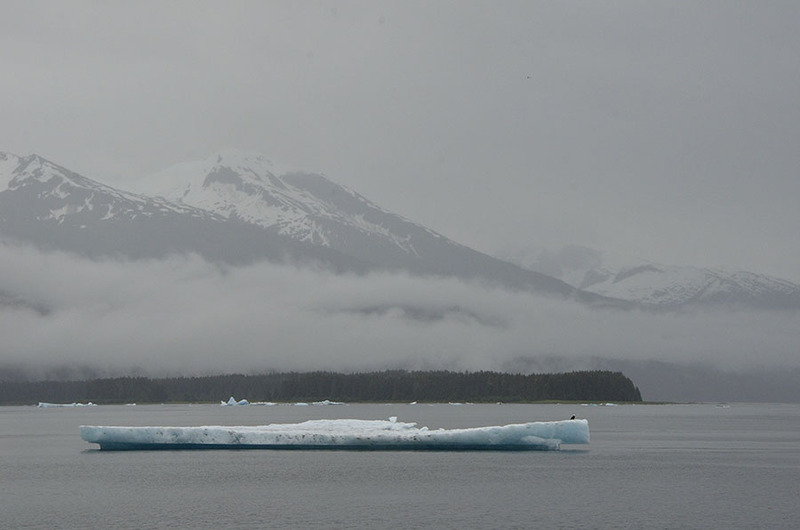 Some people from one of the other boats kayaked to shore the next morning to check out the grounded ice, and they stood near the smaller berg that chased the first boat away. 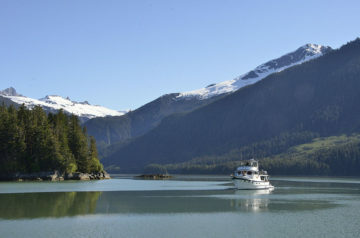 The only way for us to visit the Dawes Glacier was to spend a long day cruising up to it, and then returning to this same anchorage for another night. Given that the extra high tide would occur around 1am and the strong wind was predicted to continue, we abandoned our glacier visit plans for another time. Instead we left early to catch the morning calm and the tide, and tuck into a more restful anchorage farther north. …well, almost. 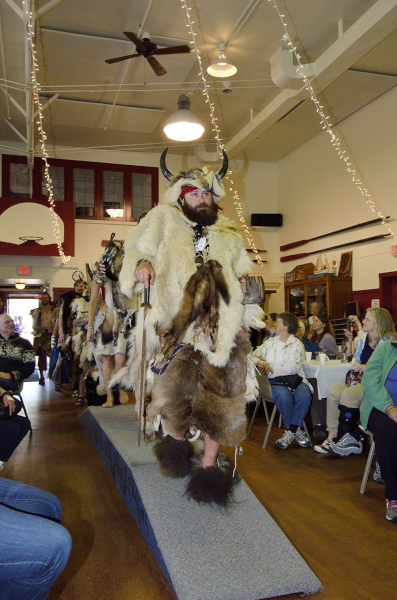 Petersburg is widely known as Alaska’s Little Norway, and it wasn’t that many years ago when it was normal to hear people speaking Norwegian walking down the street. With a strong heritage it’s not surprising that Petersburg celebrates Syttende Mai – Norwegian Constitution Day – in grand style. In Norway it’s typically a one day event, but in Petersburg we celebrate for four days! 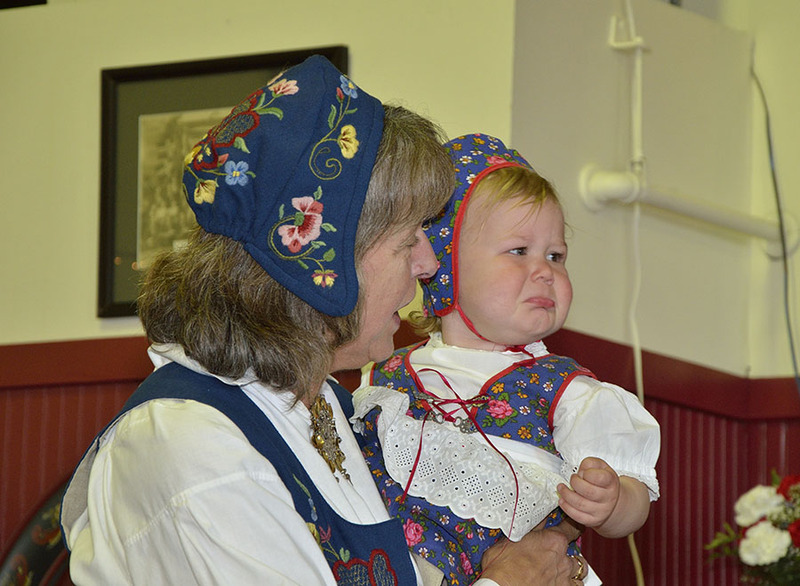 The Little Norway Festival attracts people from many places, though the festival is really by Petersburg, for Petersburg… a chance for anyone and everyone in town to channel their “inner Viking”. 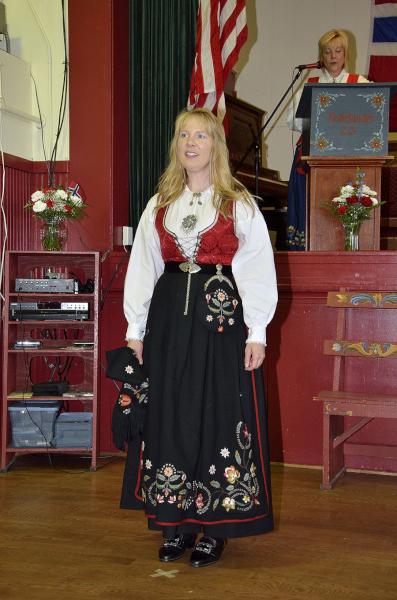 Next up was the popular Bunad Style Show which is a fashion show for the traditional folk costumes of Norway and other parts of Scandinavia. 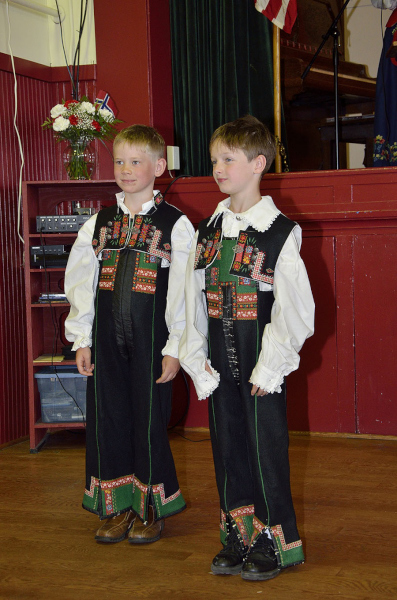 Unlike a lot of traditional garb in other countries, bunads are still worn in Norway for formal occasions such as weddings and christenings. 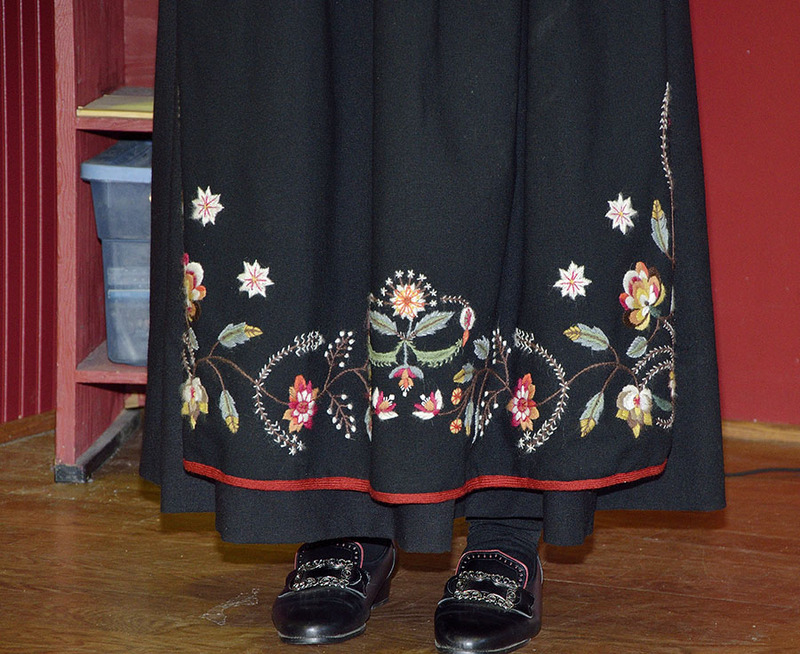 The detail of these costumes is amazing, with elaborate embroidery and jewelry. 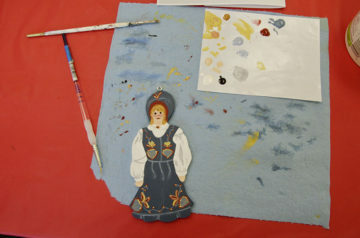 A bunad can take one to two years to make because of all that embroidery, and many of the bunads in town have been made by our Harbormaster Glo, a few by the ladies themselves, and a few have been purchased in the old country. We saw about 75 different costumes for men, women, and children. The children’s bunads have cleverly hidden ways to adjust them for size as the child grows. …but not all of the models were happy about it… …and the vikings and valkyries weren’t happy that they weren’t included, so they crashed the party! 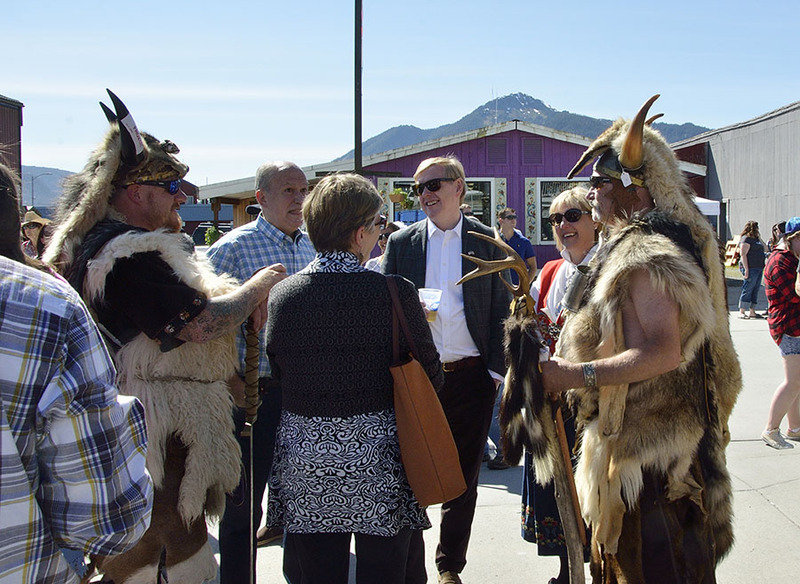 The Norwegian Ambassador to the US was visiting Anchorage recently, and he adjusted his trip so he could check out Petersburg’s festival. 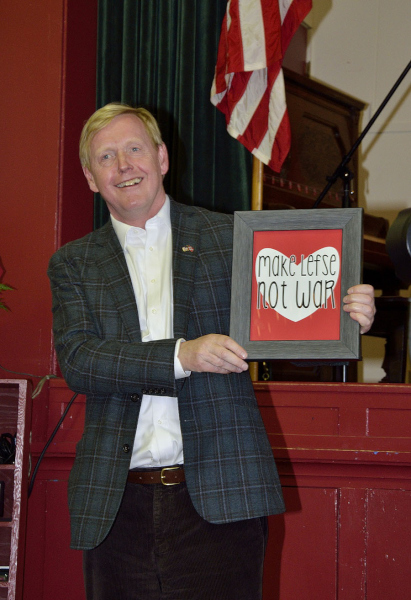 The committee made a special gift for him to aid him in his international negotiations: a sign that says “Make Lefse, Not War”. Lefse is like a Norwegian crepe that can be filled with a variety of things, though butter and cinnamon sugar are local favorites. Whenever there’s a pot luck and someone brings lefse, you better grab some quickly since it always vanishes first. 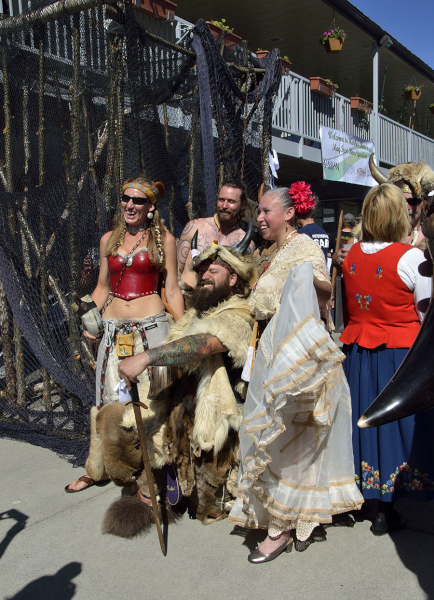 Alaska’s Governor also came to town for a day to enjoy the festival and we noticed he took the Ambassador to negotiate with the vikings and valkyries around town. 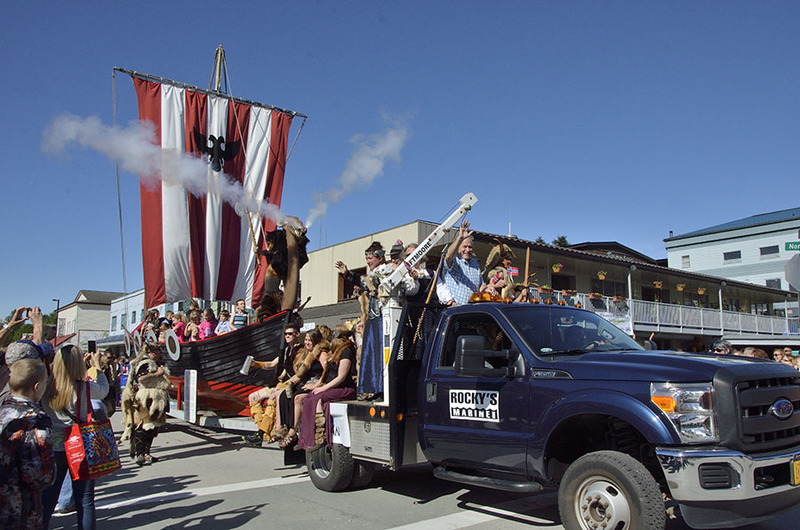 The negotiations must have been successful since they let the Governor ride with the viking ship in the parade. 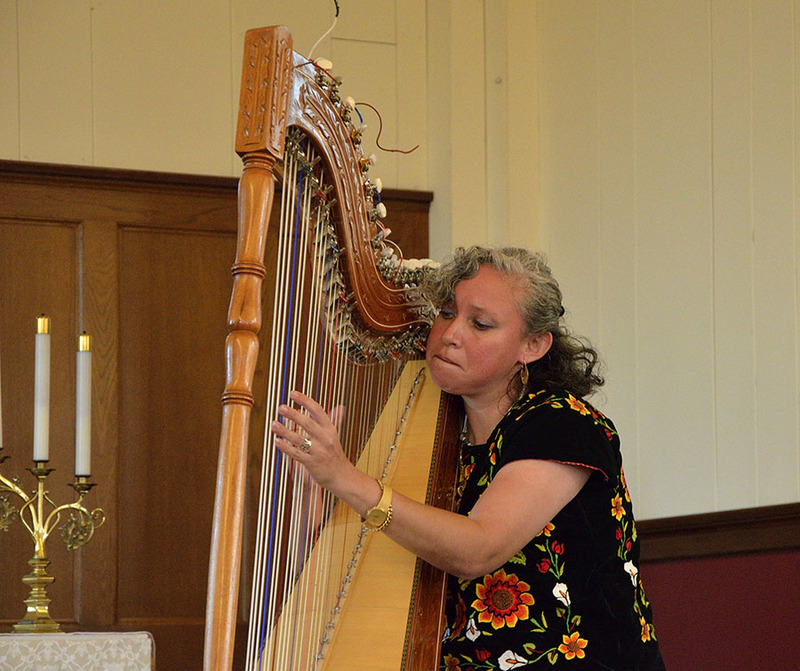 Through connections with a local friend, we were treated to a visit by an internationally known harp player from Mexico, Cristina Cabrera, and she rocked out on her harp riding a flatbed truck in the parade and made friends with the vikings and valkyries. She later gave two concerts in a more intimate setting and we were amazed at the range of her performance and the skill and passion of her playing. There was a funky puppet show kind of play done by a group from Haines, and the show and props were specially made for their Petersburg performance – it was about a Norwegian fisherman in the belly of a whale (what else could it be?). 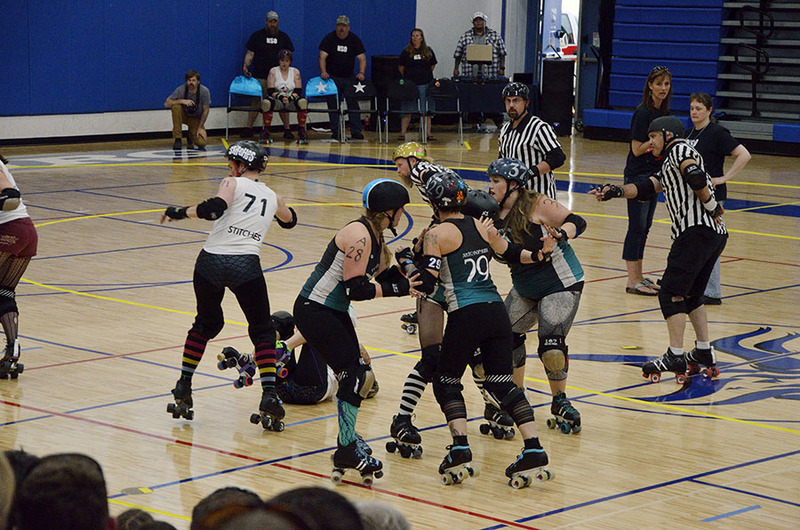 And if a Mexican harpist or puppeteers didn’t interest you, there was roller derby featuring Petersburg’s own Ragnarok Rollers. 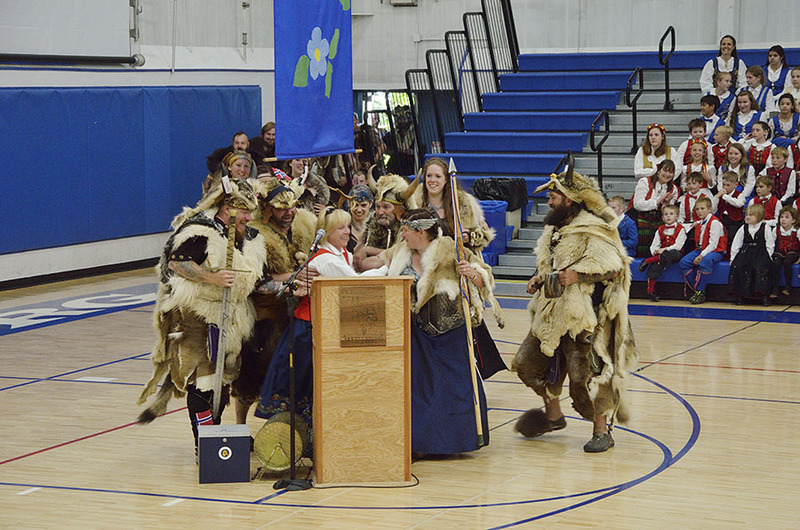 The final pageant was disrupted when the vikings and valkyries (once again, irritated because they weren’t invited) crashed the party and kidnapped our mistress of ceremonies. (I hate when that happens.) 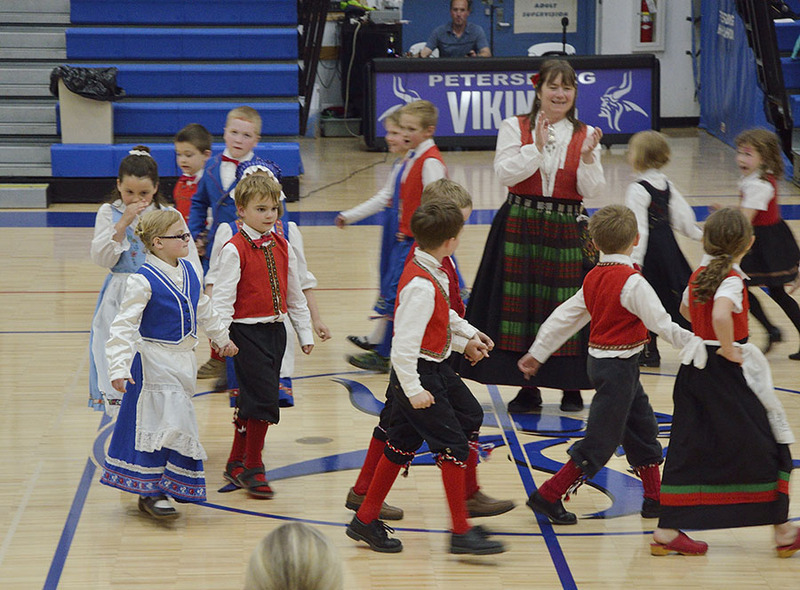 We were treated to Norwegian dancing by the youngsters – three different age groups, though the youngest are my favorite. They entertain tourists who stop in Petersburg on some of the small ships in the summer, showing off a little Norwegian heritage. We were lucky to have glorious weather for the festival, and we had a marvelous time at all the events. 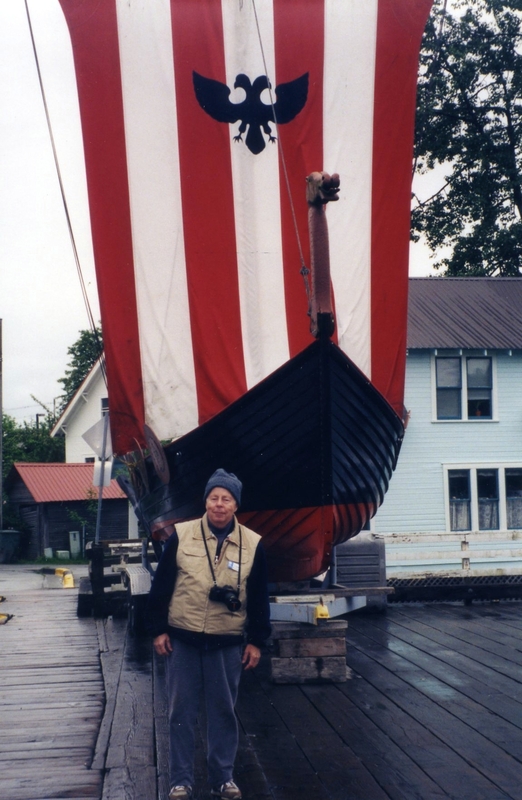 I was recently looking through old photos and I found a picture of my Dad standing in front of Petersburg’s viking ship taken in 2000 when my parents took the Lindblad small ship cruise in southeast Alaska. Dad’s grandfather came from Mandel, Norway – a salmon fishing town, and it feels like I’ve come full circle to live in a little out-of-the-way place that my parents once visited, and that my town is also a salmon fishing town. Cruising in remote places means that if something breaks we’re pretty much on our own to fix it… so it’s a really good idea to do a little shakedown trip not too far from home to check everything out, and so we can order parts and supplies as needed before we head out for the rest of the summer. Despite rainy windy weather we had a wonderful time anchored in Ideal Cove, “unplugged” from phones, Internet, and the hectic pace of town. We cooked, read, knitted, puttered, and generally got caught up. 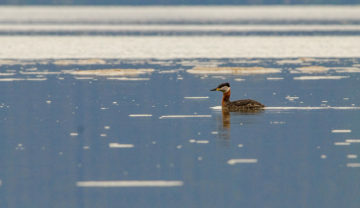 I was able to get the kayak out a few times, and was rewarded by some nice wildlife sightings such as this red necked grebe and a really funny pair of river otters – a parent and pup. You have to look closely to see the pup – it was clinging to its parent’s back, and it was squalling very loudly as the parent dunked and dove at the water’s edge. 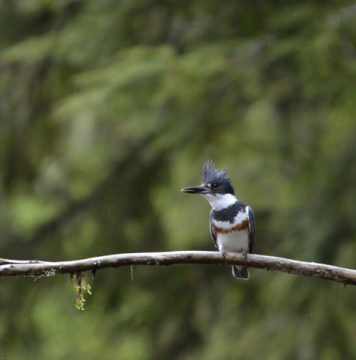 The next day I didn’t see the pair as much as I heard them from across the cove. 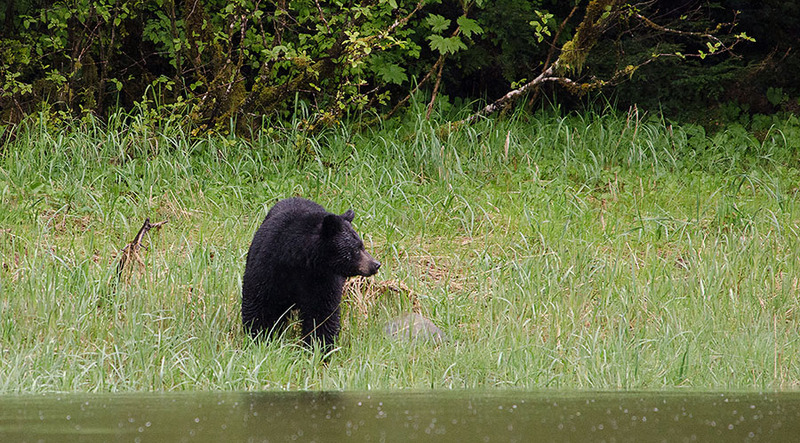 Usually spring is a good time to see bears along the shore. They’re hungry, but their favorite foods: berries and salmon aren’t ready yet so they eat sedge grass in the meadows and dig for clams at low tide. We only saw one black bear in almost a week, and he didn’t stay around long. The weather improved and we decided to move over to Thomas Bay for a change of scenery. We saw our friend Ray aboard VIDA – a DeFever hull that has been converted for commercial fishing – he was catching some King salmon for dinner. 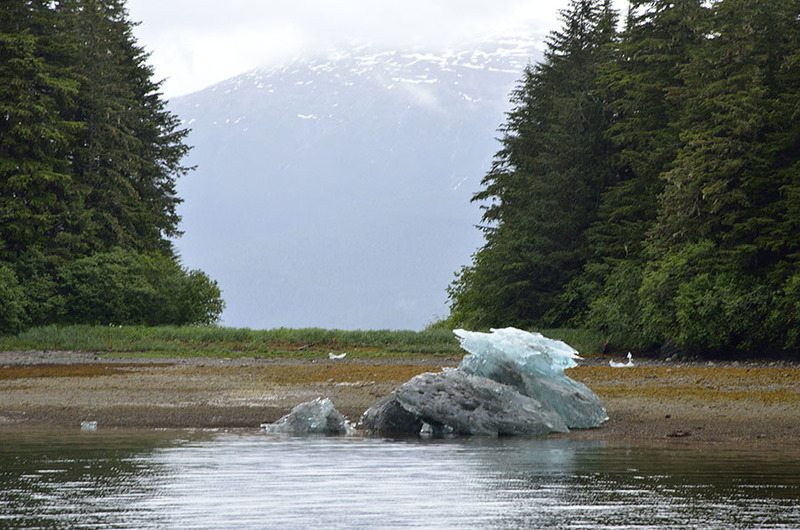 The ebbing tide carried some good sized ice from the Le Conte Glacier, and we saw this bergy bit with a bald eagle hitching a ride. Thomas Bay is a big bay, originally formed by the Baird Glacier which has retreated quite a distance and left a grand landscape. 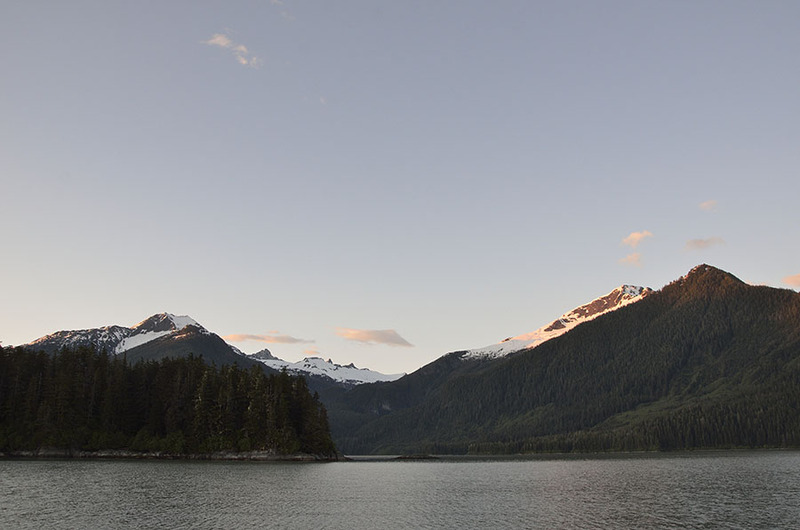 The view from our anchorage is so pretty by day… …and also in the late evening with a little alpenglow. We finally had some clear skies and sunshine so we decided to abandon the boat projects and take some time to play. We put the dinghy in the water and zoomed across the way to check out the waterfall, and then we started heading up-bay to walk around on the gravel bars in front of the glacier. About half-way up the bay the outboard started coming out of the water – the power tilt switch must have shorted in the “up” position! We shut the engine down and disconnected it from the battery, and thought about what to do. We didn’t see any other boats around to hail on a hand-held radio. We could have torn into the engine to see what we could do, but with it tilted all the way up that wasn’t going to be easy. It was a gorgeous day with no wind, so we decided to get some exercise and just paddle the dinghy back to ADVENTURES. The dink (“Beastie”) weighs about 600 lbs and it’s too wide to row with oars, so it takes two people, each sitting on one of the tubes to paddle it with canoe paddles. 90 minutes later we were back aboard and Jim was able to disconnect the offending switch. An adventure! 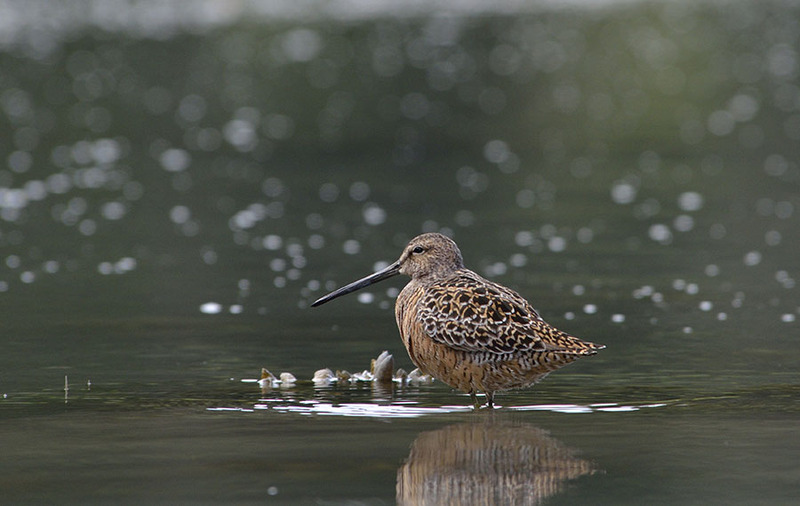 Once my arms recovered I got out in the kayak and found some nice birds in a back bay accessible at high tide. Barrows goldeneye ducks were cruising around, and I was able to sneak up on this dowitcher and get pretty close. 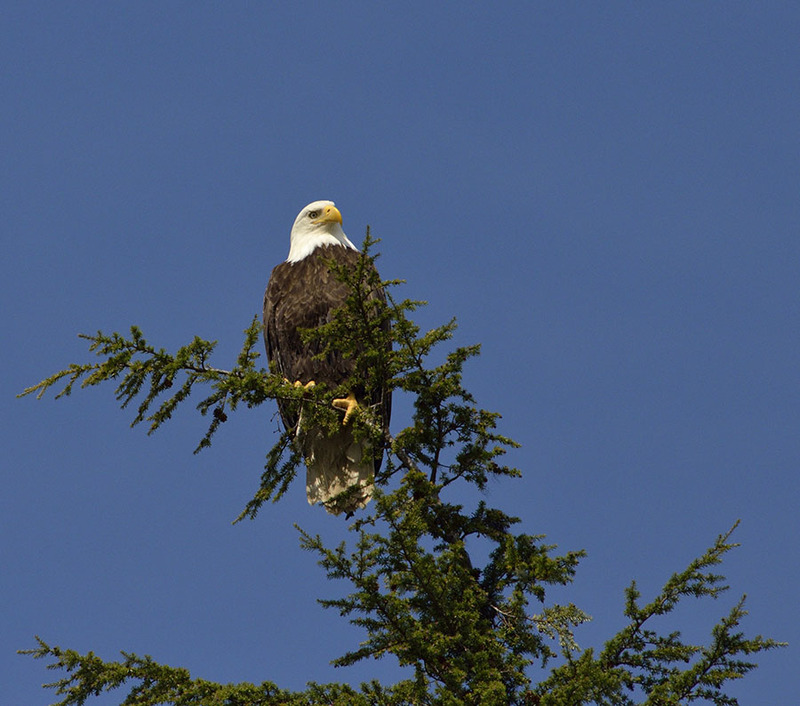 Eagles and arctic terns were plentiful, and we also saw all three types of loons: common, pacific, and red-throated. 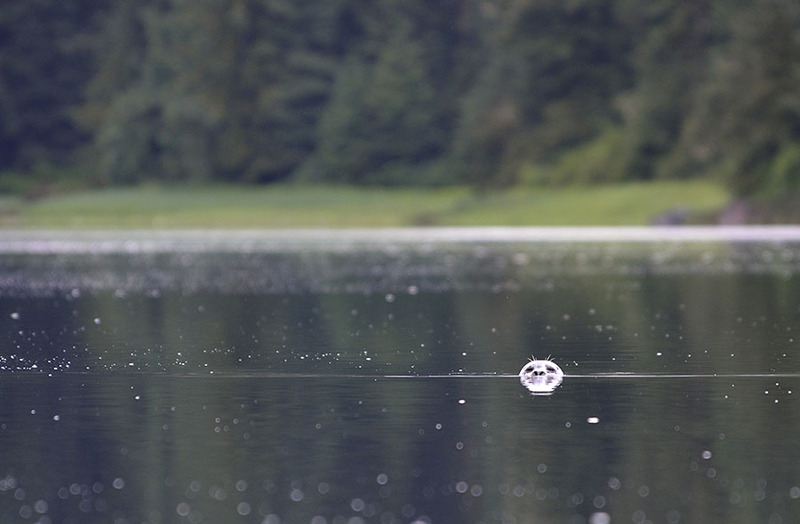 The loons often stay a bit far to photograph easily, but the eagles are accommodating. 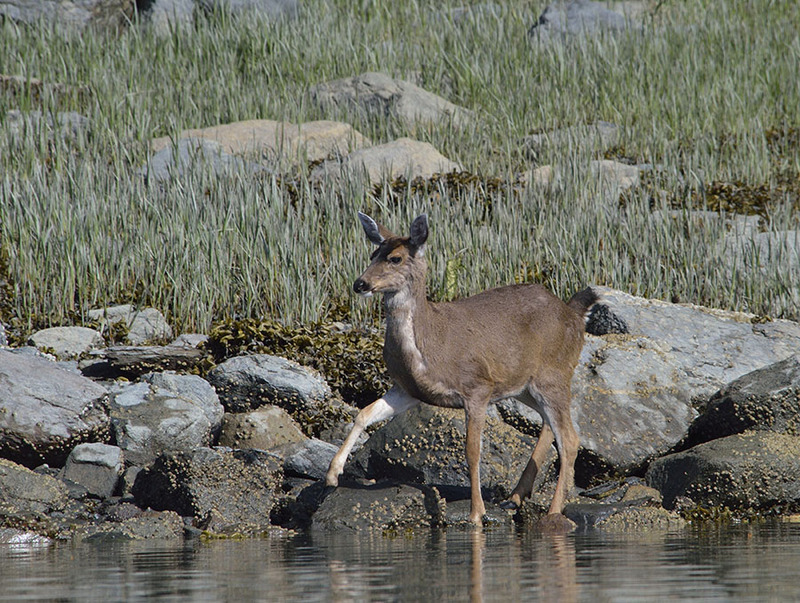 Even the black-tailed deer were brave, and I could drift fairly close to a pair that came out of the woods, sniffed around the shoreline, and then wandered through the wildflowers back into the trees. 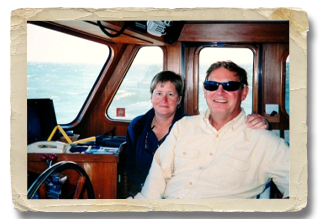 Just to top off the shakedown cruise, we had a short visit from friends on ADVENTURES’ sister ship – GOT THE FEVER. The two boats were built in the same year in the same yard, and we’ve cruised with GTF to Nova Scotia with the previous owners. The current owners shipped her out here and are cruising with their young sons. We’re just sorry we didn’t get more time to spend with them, but it was a nice surprise to see them again. 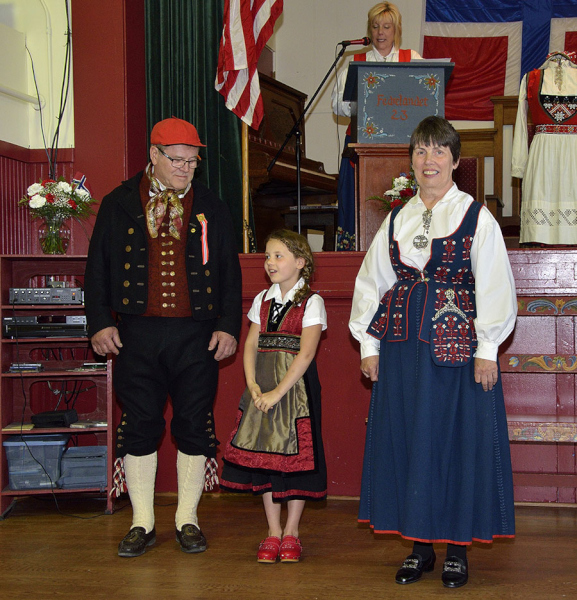 It was hard to leave the bay, but it was time to get back to town to order a few parts, see the dentist, and to enjoy the Little Norway Festival – which Petersburg celebrates in style!